Now that it’s pretty much finished with Moto smartphone launches for the year (what with the new G4, G4 Plus, G4 Play, E3, Z, and Z Force all having already been made official), Lenovo is moving on to its other brand – Vibe. And its next device will carry that name. In fact, it’s going to be the successor to the Vibe P1 from last year and Vibe P1 Turbo from February, and as you’d expect its name will be Lenovo Vibe P2. 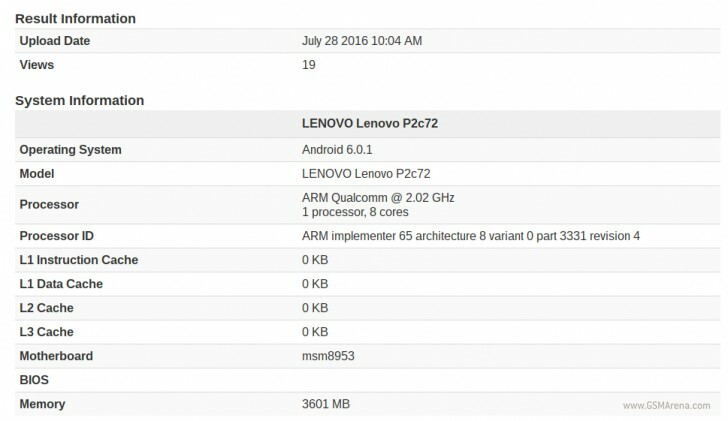 This handset has been benchmarked today, and through Geekbench’s listing we get a glimpse at a couple of its specs. The device will be powered by the Qualcomm Snapdragon 625 chipset, which features a 2 GHz octa-core Cortex-A53 CPU and the Adreno 506 GPU. It will be aided by 4GB of RAM, and the phone will run Android 6.0.1 Marshmallow. Those specs are a welcome step up from the Vibe P1’s Snapdragon 615 and 2GB of RAM, as well as the P1 Turbo’s 3GB of memory. Unfortunately other details about the Vibe P2 aren’t known yet, but since the leaks have now started we expect to hear more about it soon.